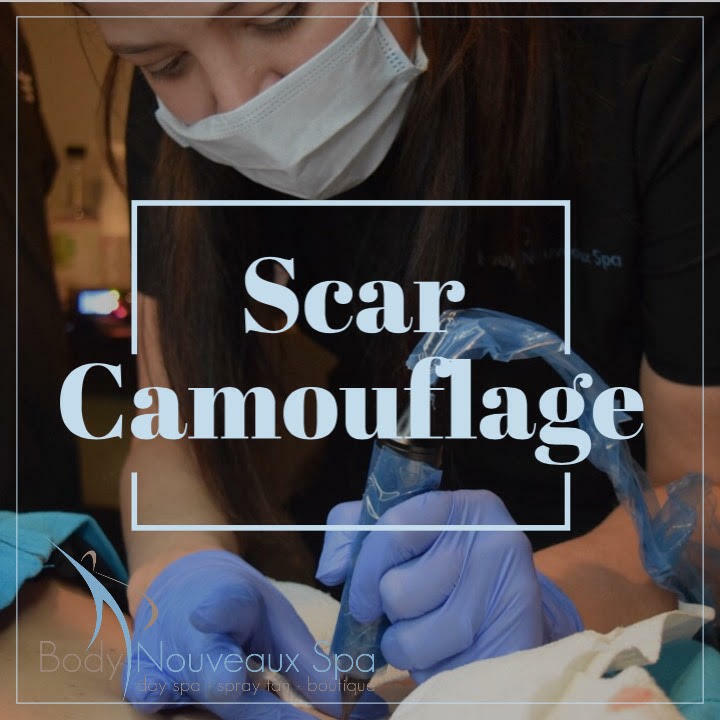 Scar camouflage is an exciting alternative treatment that works directly on damaged skin, relaxing and smoothing scars, also reducing stretch marks. Essentially this treatment brings new life into damaged skin and by using a digital tattoo machine this can be done in a very quick and precise way. When pigment is used, flesh tone colors are the options. The entire basis for this type of Tattooing technique, is to glide the needle groupings across the very surface of the skin to add a light dispersion of flesh tone color to camouflage the blemish. Tattooing done properly also NEVER uses dry needles. If no pigment coverage is required, a base vegetable glycine serum, which is the base mixing ingredient for most all commercially produced Tattoo colors used in body-art, permanent cosmetic pigments, and Microblading pigments is used). So this technique is doing the exact same process that body artists do while shading, just leaving out one possibly allergenic element. Scar Camouflage is not a new service to the market, it was actually invented by tattoo artists over 30 years ago. At Body Nouveaux Spa, I've decided to call this treatment Scar Camouflage. Its a term more easily understood (or let's be honest google searching haha!) by the public to whom I am aiming my service at. Dry tattooing; because of flesh tone coloring used, distinguishes the treatment from other micro needling, skin needling treatments such as the derma roller or Derma Pen. I am very excited to bring this to Lincoln, Nebraska. So why is it called "dry" if the technique doesn't use dry needles you ask???? I agree it can be a little confusing. I've learned the industry uses many names or terms when describing a technique. What is important is what or how is it actually being done, what it is called is just a "name". But one way I look at it, I see it this way... because this is a tattoo shading process (which is explained a little more in a bit) I will not be making this big elaborate artistic picture on the skin (which normally society instantly thinks "tattoo") I am more so trying to camouflage the unwanted scar so I am trying to make it look as if nothing was done to the area, not leaving a mark. My goal is to give the ILLUSION that the area is "dry" or back to normal (or as much as we can get it). So the term "Dry Tattooing" make sense to me. Dry tattooing works on the specific areas of affected skin only i.e. each stretch mark or only the scar. Areas that are not affected are not treated. Scar Camouflage is a much more gentile process than standard Body-Art, but still very much the same by process. A byproduct of tattooing over any tissue that has generated elastin due to a scar, is that the elastin fibers spread and the tattoo process stimulates new, normal skin cells that naturally normalize the skin surface texture. This simple process, no different than light body-art shading (the least aggressive technique used in tattooing) changes the lives of clients such as a burn victim who may not want body art all over the burned area such as the face. Dry Tattooing/ Scar Correction can be used on all colors of skin, with only dark skins prone to over pigmentation. Your scar must be at least 1 years old. For clients who are prone to develop keloid scarring are advised not to go forward with this type of treatment. 20-50% improvement can be seen in just ONE SESSION, with a course of 3 treatments recommended for optimum results. This is very exciting to me as so many people think they have to just live with their scars. This can provide miraculous results that will rebuild their confidence in their appearance. I HOLD MY BODY ART - PERMANENT COLOR TECHNICIAN LICENSE & also am NEBRASKA BOARD APPROVED to bring scar camouflage to Lincoln. I have been providing Lincoln with our famous Slender Body Wraps since 2001. When my clients come to see me for a series of wraps, I help them lose inches (often pant sizes), plus look and FEEL great in and out of their clothes. My wraps are great ways to get them ready for a special event (wedding or vacation); or even better- they schedule their wraps along with their weight-loss program to help achieve their goals even faster! Why am I now offering Scar Camouflage? During all these years, so many of my clients would have disfiguring scars or stretch marks (which are also a 'scar') that made them feel very self conscious, and I wanted to see how I could help them with this as well! I just felt it was the perfect addition to the services i already offer. I'm excited to provide this technique to our clients! Book your consultation for your scar or stretch mark correction treatment today!